Not being much of an alcohol drinker, I'm not against it - I just never learned to like the taste of alcohol. Still, in some social occasions I still like to attempt to drink a glass of wine and I don't tell friends or guests to my home 'no thank you' when they come bearing a gift of wine. For this reason we do have some wines in our home that are opened, but I can guarantee you they will not be finished. While looking at two opened bottles of red wine on my counter (both given to me) I decided to find a new way to use them up. Something different than a marinade or a salad dressing. In the end I took about 3 versions of poached pears and mixed them up to come up with this recipe for my collection. I can use up a half bottle of wine with this recipe and make at least 3 pears out of it. Scoop out the center of the pear by using a melon baller and start to whittle away at the bottom. 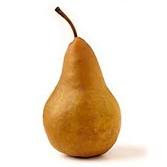 Work your way up, scooping out the inside so the pear is much like a bell. In a medium saucepan, combine the wine, cinnamon, cloves and sugar. Stand the pears upright in the mixture, then bring to a simmer over medium heat. Simmer, uncovered, turning the pears often, for about 35 minutes, or until the pears are just tender. Serve warm, room temperature or chilled. Scoop a dollop of whipped cream on them for children or for adults, sprinkle with crumbled bleu cheese and chopped toasted walnuts. Almost 9 years ago I discovered and started to use Splenda - the sugar alternative. It was part of discovering the low-carb lifestyles and the effects of sugar and flour in our systems. Although we don't regularly follow any low-carb way of life, we do do a detox version about twice a year and I keep a huge file of low-carb, sugar free recipes on hand as well as two cookbooks I wouldn't be without. This is just a simple sugar free vanilla spread - great on graham crackers, fruit or delicious on toast. It's CONTEST TIME! 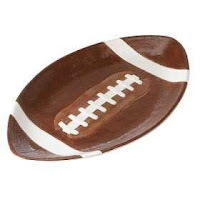 It's time to throw a FOOTBALL PARTY! EDITED TO ADD: CONTEST HAS ENDED! THANK YOU! Our household has two die hard football fans but all five of us love game days because one of our favorite meals is what call, 'football food'! Basically it's a day of fun foods like a crock pot of nacho dip, cheese and crackers, buffalo wings, stuffed jalapeno poppers and other finger foods. Shake 'N Bake provided a free sample of one of their new products and I couldn't wait to pass it along. New Crispy Buffalo style! It's exactly what my family loves; the crisp and the spice without the mess of ooey, gooey sauce. Heat your oven to 400 degrees. Dip your chicken in the hot sauce to moisten (or skip this part if you want a mild buffalo flavor). Shake the chicken pieces in the coating using the bag provided in the mix. Bake on a foil lined baking sheet for 15 minutes for tenders or up to 35-40 minutes for wings until done. Serve with celery sticks and ranch dressing on the side. Now for the REAL EXCITEMENT - the CONTEST! A prize pack that includes; Shake N' Bake, ceramic football plates and more... a little something that I'm not going to mention and make it a REAL surprise! Delivered to your door just in time to host a great football party! All you need to do to enter is tell me if you are ready for some football fun! 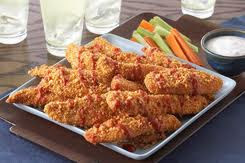 Email me to let me know you are ready to serve some Shake N'Bake Crispy Buffalo tenders or wings at your party. All entries must be in by 8:am Saturday, September 25th (CST). Winner will be drawn around noon my time (as soon as our out-of-town guests leave around 11:30 or 12:00!). *Canada is included in this one! I just heard from the company this morning that they'll ship to addresses other than the USA! You MUST give me a working email when you enter so I can contact you if you are a winner. If I cannot contact you by email to get your name and shipping address to give to the Kraft marketing crew, I'll have to draw another name and you forfeit your prize. Your email will not be saved nor used for anything other than one entry into this contest. (I was going to use comments to enter as well but blogger is being persnickity and comments aren't showing up right now so EMAIL ME to enter and that way I KNOW I'll get it!). A few years ago I started to make incredible Caramel Apples in the Autumn. Not just caramel apples, but apples like you can buy for $15 each on gourmet websites with chocolate, and white chocolate drizzled over and candies and mini chips.... these became a much requested school fund raiser for their Fall bake sales. I'm almost frustrated to admit that my full time work schedule coupled with doing the finances, cooking, errands, cleaning, laundry, school functions and other life-chores has kept me out of the kitchen as I would like to be. Most things are done spur-of-the-moment and not up to my usual standards. But still... last night at 8:00 pm I started to make caramel apples. If you don't go crazy with the gourmet decorations they really are quick to make and easy... as long as you don't mind getting a little gooey!! *optional; mini chocolate chips, toffee bits, sprinkles, etc. Melt the unwrapped caramels with 1 tablespoon water in a microwave safe bowl on 50% power for about 2-3 minutes depending on how strong your microwave is. 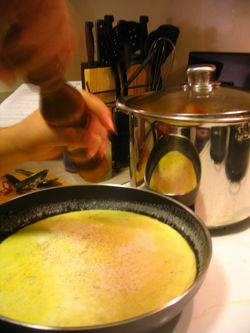 Stir until completely smooth and the water is incorporated. Push a stick in a clean, washed and dry apple and dip into the melted caramel. Hold upside down for a bit, swirling as the caramel cools quickly so it doesn't all puddle down around the apple. Place on parchment paper, foil or plastic. If you want to add sprinkles or candies do so before the caramel sets too much so they will stick. Ready to start dipping and rolling the apples. Mmmm... my family started to gobble them up before they were even cooled down! Arriving home last night after working an event all day, I was starving, it was 6:pm and my kids were waiting for me to make dinner. While I would have loved to have picked up pizza on the way home I knew it was neither frugal nor needed when I could make my own. I immediately got the ingredients for pizza crust mixing in the electric mixer with a dough hook while I pulled random ingredients out of the cupboard. Craving a pizza with smoked cheese and chicken I knew the perfect sauce - a creamy garlic sauce I had made previously for pizzas. Because I had just arrived home at 6:pm since being gone that morning at 8:30 am I had neither cooked nor thawed chicken at my disposal. As I went to the freezer to see what I could improvise with I saw that I had picked up a package of Tyson's grilled fajita chickens trips on my last trip to the store. Yeah for me! (Or yeah for my 14 year old who asked me to keep some on hand for after school snack wraps, chef salads and mini pizzas). I improvised on the sauce and added minced basil this time instead of parsley and the end result was fabulous! - Remember - improvise and use more/less ingredients based on your own personal tastes. Melt the butter in a saucepan. Add the garlic and flour. Whisk or stir briskly about a minute or two but don't burn it (burnt garlic is gross!). Add the cream and basil. Whisk til smooth. Spread on pizza dough in pan. Top with grated cheeses and chicken. Bake at approximately 410 degrees for 20 minutes or as you usually bake your pizzas as everyone's pans and ovens are different. When the top is golden, remove, set for a minute or two and slice and serve. Top with cheeses and chicken and bake! *if you use a store bought pre-baked pizza crust like Boboli - then only bake about 8-9 minutes until the cheese is melted and golden. Over the past few years a simple tortellini pasta became a staple at many summer meals as I knew I always had ingredients on hand to throw together. I don't have to worry about a recipe because I never make the same salad twice! Sometimes with cucumbers, sometimes tomatoes, I've used balsamic vinegar in place of of the Italian when it's what was already made in the refrigerator... the basics stay the same (pasta, dressing, black olives, cheese of some sort) but add artichokes if you want or perhaps capers this time or change the cheeses from provolone to mozzarella or even feta. When it comes to chicken or tuna based pasta salads I almost always use a mayonnaise based or 'creamy' binder. I rarely use an Italian dressing and pasta paired with tuna or chicken. This recipe does. What do you think? Mix the tuna, green pepper, onion, and black olives in a large salad bowl. Add the dressing, mixed herbs and salt and pepper to taste. Mix well and add the pasta. Toss, cover and refrigerate for at least 30 minutes before serving. While I love the Chimichanga idea today I also wanted to share a yummy grilled recipe for those lucky enough to have good weather today (Labor Day) and need an outdoor recipe. This fits the bill! Grilled steaks are a favorite of my husband. Sometimes we top them with a spicy rub, other times I soak in a marinade. A delicious way to serve is just to season with salt and pepper and serve with a mound of sauteed onions and mushrooms. A blue cheese sauce is another way I love them. 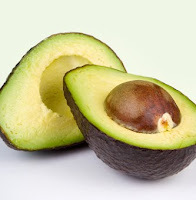 This one uses a favorite food of ours; avocados. Enjoy! Mix the dry spices and rub into the steaks. Cover and refrigerator for 2 hours. Make the salsa by peeling and dicing the avocado and adding the diced tomato and jalapeno with the cilantro, lime juice, onion and salt to taste. Chill. Grill your steaks to desired doneness and serve with a scoop of salsa on the side. By now most of us know how to make the deliciously easy 'cheaters' version of chicken enchiladas with cream soup and cream cheese. This is similar but the extra step of making them into chimichangas, fried in oil and served with a sauce instead of baked makes them different than an enchilada but similar and oh so good! Mix the soup with the chilies, jalapeno pepper and lime juice in a blender or food processor and process until smooth. . Warm in the microwave or saucepan to heat gently. In a bowl mash the cream cheese with the monterey jack cheese and taco seasoning until blended. Stir in the chicken. Divide the mixture into the 8 tortillas. Fold the sides in, then roll it up to make a secure packet. Heat the oil in a pan and fry the chimichangas a couple at a time, seam side down, until golden brown. Flip and do the same on the other side. (About 1 1/2 minutes per side should do it). Drain on paper towels. 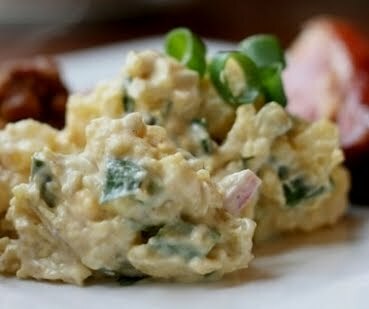 Place on a plate, ladle warm sauce over, sprinkle with cheddar, top with green onions and sour cream. OH NO! I've been so busy working overtime at my job the last few weeks that I've completely and utterly FORGOTTEN it's a holiday weekend! I actually worked yesterday as well (Saturday) so my weekend is completely 'off' and I keep thinking today is Saturday when in fact it's already Sunday. So in honor of the American holiday and all the backyard bbq's and camping trips going on... recipes with Labor Day in mind! Let's start with dessert first! Any canned fruit filling will work; peach, apple, blueberry, etc. I love CHERRY best of all for this recipe. Spread pie filling in the bottom of a baking dish. Sprinkle dry cake mix on top of the fruit filling. Drizzle butter over all. Bake for 30-40 minutes until golden. Serve warm or cold - it's amazing warm with vanilla ice cream! Another 'dessert' of sorts - and it's an old Granny recipe! Remember that fruit salad Grandma served with macaroni in it? It's baaaaack! Drain fruit and save all juices. Place drained fruit in a large mixing bowl. In a large saucepan, combine the fruit juices and 1 cup of sugar, 2 beaten eggs, 2 Tbsp. cornstarch, and 3 tsp. vinegar. Cook until thick over medium heat, stirring constantly. Cool in refrigerator. In the large bowl, mix fruit juice mixture, the cooked pasta, and the whipped topping. Chill. Rinse pasta in cold water to cool. Combine all ingredients. Let stand at least 30 minutes if you can for the tastes to combine. More 'main dish' recipes coming in the next post!